Even the most beautiful smile can suffer from a missing tooth. A talented restorative dentist such as Dr. Samir Ayoub has the ability to replace a tooth lost to dental disease or a traumatic injury using several dental restorations. One of these restorations Dr. Ayoub offers in his San Francisco practice is a dental bridge, a device that fills the space left by a missing or extracted tooth. 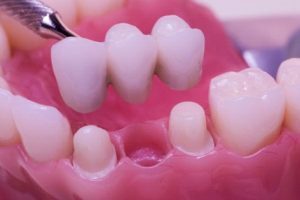 A bridge not only replaces the look and feel of a missing tooth, but also prevents the surrounding teeth from shifting around into the gap and also prevents problems with the bite and jaw. If you have lost a tooth, or had a tooth extracted, and need a secure way to restore integrity to your smile, consider dental bridge treatment with Dr. Ayoub. Since dental bridges are supported by surrounding teeth, you must have healthy, intact teeth on one or both sides of the gap. If the support teeth are decayed or structurally unsound, Dr. Ayoub may need to build them back up before placing the crown. Your gums should also be healthy, since they support the teeth that hold the bridge. To determine whether you are a good candidate for treatment with dental bridges, please contact Dr. Ayoub’s practice today. Successful treatment with dental bridges begins with careful planning. Dr. Ayoub will examine your mouth, looking at both the gap left by the missing tooth and the remaining teeth. He will recommend the best kind of bridge for your case. A conventional fixed bridge consists of an artificial tooth (called a pontic), supported on either side by a crown; the crowns are placed on the teeth adjacent to the gap, and the pontic fits into the gap. A cantilever bridge is composed of a pontic with two dental crowns positioned next to each other. The crowns fit over the two teeth on the same side of the gap, and the pontic fits into the gap. A Maryland bridge consists of an artificial tooth attached to two metal wings. The metal wings are bonded to the back sides of the teeth on either side of the gap, and the artificial tooth fits into the gap. Maryland bridges are often used on the front teeth. Once Dr. Ayoub has recommended the type of bridge for your case and determined the plan of treatment, he will prepare your supporting teeth to accommodate the bridge. This may involve removing a small bit of tooth structure to make room for the crowns. Then, he will take impressions of the teeth and send them to the dental laboratory to manufacture the bridge to your specifications. Dr. Ayoub may place a temporary bridge for the interim. When your permanent bridge is ready, you will return to the office and Dr. Ayoub will remove your temporary bridge. He will place the permanent bridge and make any last-minute adjustments for fit or comfort. If you are interested in restoring beauty to your smile with a dental bridge, please schedule a consultation with Dr. Ayoub today. Call us at (415) 781-2227 to make an appointment.